Everyone has those days when we crave fried food. This is normal because fried food is considered one of the best comfort foods all over the world. When you coat something with batter and you deep fry it until it becomes golden brown and crispy, the flavors of the food reaches another level of deliciousness. Deep frying is a form of cooking that many do not consider an art, but it is the go-to cooking method found in state fairs, where the smell of funnel cakes, corn dogs, and other fried goodness will create nostalgic feelings. The problem with fried food, however, is that we can get them through fairs and fast food joints, but these places aren’t always accessible. If frying food at home using a normal frying pan, you may not get that perfect crisp and golden brown coating with the perfect crunch. In fact, many at home deep frying end in either disastrous food, or worse, accidents and injuries. If you want to achieve that crisp deep fried food you’ve been craving, a deep fryer like the Hamilton Beach Deep Fryer with Cool Touch will definitely satisfy your cravings. Learn more about this product’s features, advantages, and disadvantages to see if this will make a good addition to your kitchen. When it comes to deep fryers and other revolutionary kitchen gadgets, there is one brand that stands out and is considered very reliable: Hamilton Beach. This brand for kitchenware has been around since 1910 and has been the go-to of many homemakers for over a century. The Hamilton Beach Deep Fryer with Cool Touch doesn’t disappoint either. It has many unique and useful features that have made users appreciate the deep fryer. The design of this deep fryer is a big hit with home cooks because it is easy to remove for draining and cleaning, which can be a hassle if you’re deep-frying. The safety features of the Hamilton Beach Deep Fryer with Cool Touch are also something that many of its users love. For one, the unit does not get hot when it is deep-frying because it provides proper heat insulation. Another safety feature is that the lid can be removed during deep-frying. Having the chance to properly deep fry food without the risk of hot oil splattering around is a great advantage. Plus, without oil splatters all over your kitchen counter, clean up after deep-frying becomes a breeze. 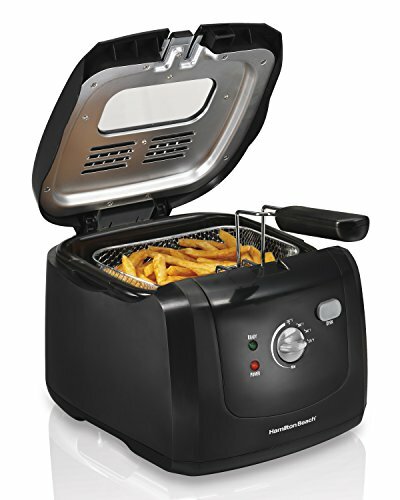 The capacity of the Hamilton Beach Deep Fryer with Cool Touch is also a big advantage as it can hold up to 8 cups of oil and fry up to 6 cups of fries in just one batch. This allows you to fry a good amount of food in one go that will be enough to feed two to three people at the same time. The Hamilton Beach brand has produced well-built and affordable kitchen gadgets that make cooking at home fun, easy, and enjoyable. Get ready to serve up some perfectly fried comfort food with your own deep fryer. One problem with the Hamilton Beach Deep Fryer with Cool Touch is the length of the cord. The short cord does not stay plugged in when the unit is moved, and this can be a hassle. Although it can be troublesome, this is actually a safety feature to prevent you from moving the unit while it contains hot oil. This unit also does not come with a timer; this is considered a disadvantage especially if you have not deep-fried before. It takes some practice to know the correct time to produce perfectly fried food. If you are patient you will learn quickly how the machine works. Others also note that this unit does not make the oil hot enough to fry food correctly. It might take some time to get the oil to heat up to the right temperature level. If it does not heat up, you may need to adjust the temperature settings. Keep a food thermometer with you just in case and monitor the oil temperature if you want to be extra sure it’s achieved the proper temperature. For a deep fryer that is affordable and can cook enough fried food for two to three people, the Hamilton Beach Deep Fryer with Cool Touch is a great option. The brand is known for making high-quality and reliable kitchenware, and this unit won’t disappoint.